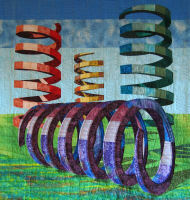 A spring quilt that reminds me of spring green grass and colorful Dutch bulb fields. The three-dimensional design is created using POV-Ray. Quilt detail. 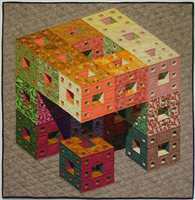 This design is based on a Menger Sponge. This design derives from the tensided tablecloth. While making the tablecloth I discovered unexpected circular patterns which I transformed into five perfect circles, overlapping in the middle of this quilt. 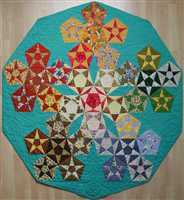 Each circle has its own theme; the basic colors for the circles are matched to the patterned fabrics used in the centres of the pentagons. Quilt detail. 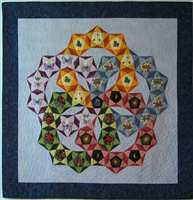 This quilt was designed for the theme '5'. De basic shape used in this tensided tablecloth for a round table is the fivepointed star (pentagram), surrouned by a regular pentagon. These pentagons form a selfreplicating pattern (a so-called fractal), which occupies a large part of the quilt. The remaining space is filled by an unpatterned fabric. Quilt detail.